I've been in a smoothie kick for the past month or two. It's my new go-to breakfast food. I once tried being super healthy and put spinach and Greek yogurt and old fashioned oats in my smoothie. This led me to choke down a few sips then dump the rest down the drain. Now I just throw in stuff I like. I love the Private Selection bags of frozen fruit at Kroger. I grab the strawberry, mango, pineapple blend, and then a bag of frozen blueberries. I usually defrost the fruit in the micro for 30 seconds before throwing it in the blender. Then I throw in some low-fat vanilla yogurt and a just a little bit of whatever kind of juice we have in the fridge. I love my Hamilton Beach single serve blender (thanks Chris and Laura! ), because it's small and easy to get in and out of the cabinet, and I don't mind washing it every day. 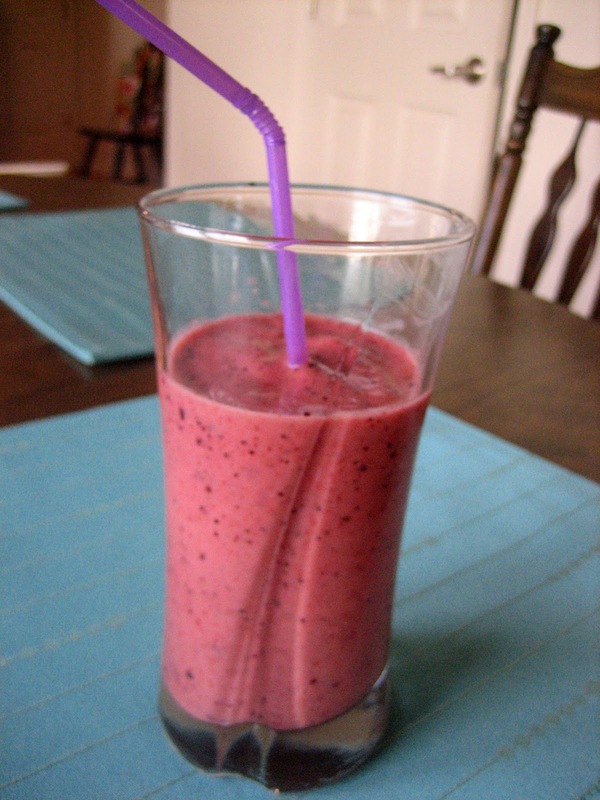 Drinking with a straw makes everything more fun, so grab one of those and you have a delicious and healthy breakfast! You're welcome! I might have to get for myself so that I can make easy breakfast shakes when I go back to work.